With difficult economic conditions across Europe and the US, shoppers maintain their recession-adjusted behaviour, refraining from embracing more ‘liberal’ buying habits. The shopping list became an important pillar of this austere conduct, but how much do consumers really stick to it while in the store? A recent study of the Integer Group, one of the largest retail and shopper marketing agency worldwide, shows that there are certain triggers that make shoppers buy a few extra-items. This is good news for any brand and grocery store as it signals that consumers are prone to be influenced inside the store too and that place-based advertising does what it says- sell. The report also acknowledges the fact that females- the ones creating the shopping lists (84% vs. 48% of males) – cut back on spending which implies that brands and retailers need to make the value of their offers clear and real. At the same time, shoppers that bought items not on their shopping list, said they’ve done so because they forgot about them when making the list. Others, the study shows, just give-in to impulse purchases, wanting to pamper themselves. The millennials are the most prone to do so (45%) and incidentally, they too have the highest appetite for digital communications. – Continue the assistance/ discussions from the pre-purchase buying stages. The study concludes by advising retailers to communicate compelling deals through innovative vehicles. With people visiting stores less frequently and spending less than they used to, the need to entice them to move outside their typical behaviour is acute. Digital signage can enable retailers to create disruptive Points of Sale and entice shoppers to buy items that weren’t considered before or to buy more of the products listed. 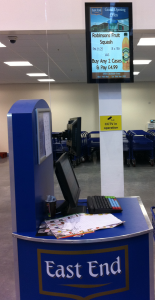 See the example of East End Foods, a British cash-and-carry that is using digital posters at checkout points to drive sales. 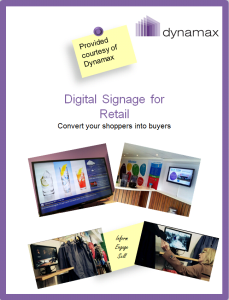 If you would like to know more about the potential of digital signage in retail, download our whitepaper or contact us. Ready to experiment with the technology? Test- drive digitalsignage.NET for 30 days for free.